This is the third trip story about or recent family vacation in New Zealand. The first and second stories were about our time in Auckland. After spending several days in Auckland, we headed south. Our ultimate destination was Wellington, where my in laws live. It is possible to make the drive in one day, but it would have been a long, unpleasant day, so we chose instead to split the drive into two, and spend a couple of days in Taupo. Taupo is a small town on the shores of Lake Taupo, the largest lake in New Zealand. I spent a night there during my very first visit to New Zealand, so this was another stop that induced some nostalgia. The drive down to Taupo from Auckland takes you through Hamilton. Hamilton is the only major New Zealand city that isn't on the coast, and is subject to much abuse because of this. On my first trip, we stopped in Hamilton for lunch, and I thought that it looked to have a nice riverside walk. I'm sure it is actually a very nice city. But we didn't stop to explore this time, either, preferring to drive on to the town of Cambridge for lunch. Cambridge is an excellent example of the small Kiwi town. It had a couple of main shopping streets, with a few restaurants and cafes. Everything was clean and everyone was friendly. We had lunch at a Robert Harris- I was still wanting my caramel slice fix after our failure to visit one in Auckland. Their caramel slices were as good as I remembered, but again, there is probably a healthy dose of nostalgia in that assessment. A Robert Harris caramel slice was the first distinctively Kiwi thing I ate on my first day in New Zealand. Unless you count the pancakes with bananas on top, which I don't. New Zealanders do seem determined to put bananas on top of any pancakes they find, but you can get that a lot of places. The caramel slice is one of the gifts New Zealand has given the world. Anyway, the nice lady at the Robert Harris directed us to an awesome playground that we would never have found on our own, and the girls had a blast burning off their excess energy before we loaded them back into the car and drove on towards Taupo. 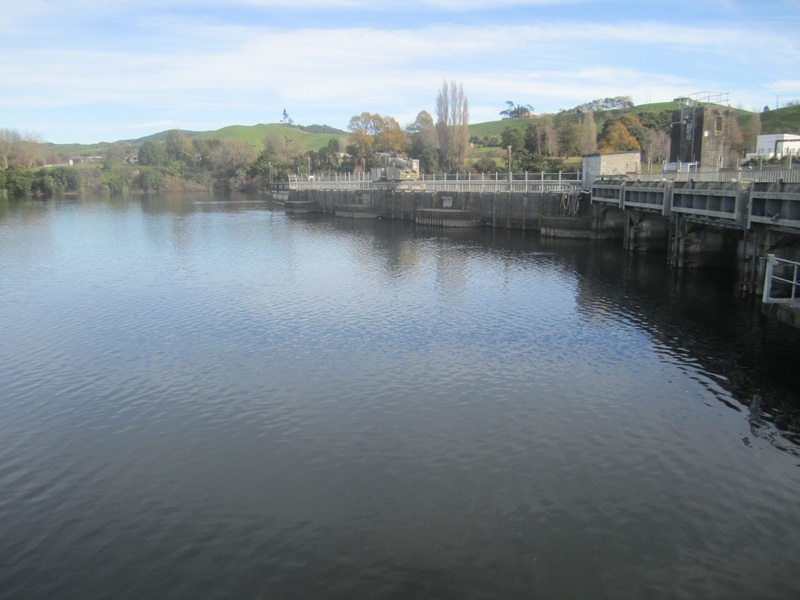 Mr. Snarky made us stop at Lake Karapiro on our way out of town, because his father used to stop there on their family drives. Or something like that. It was pretty. Not shown: the Ferrari that sped across the bridge. Apparently, the houses on the other side are quite pricey! We made decent time, and got to the Taupo area by 4:30. We thought that would give us enough time to visit Craters of the Moon, a geothermal site, but the people who run that site disagreed, and were closing up when we got there. So we went across the highway to Huka Falls, which you absolutely must visit if you ever go to Taupo. This is another site Mr. Snarky and I visited on my first NZ tour, so we always knew we'd be returning on this trip. We did not expect to return at sunset, though, and were pleasantly surprised by how beautiful the area was at that time of day. After leaving the falls, we drove on to our hotel, which was on the far side of Taupo, in a section that has grown quite a bit since our last visit. We'd picked the Comfort Inn for the details of the room, but the location turned out to be great, too. It was right on the lake. Although our room was near the road, we could walk through the property out onto a nice lakeside path. We even saw some ducks out there. which delighted the kids. There was also frost on the ground, which delighted the kids even more. They had lots of fun stomping around in the frost making footprints. We went back to Craters of the Moon after morning snack (which we had at a shop that specialized in honey... yum. The grownups and Petunia enjoyed some honey tasting. Pumpkin was too suspicious to partake.) I worried that the kids might not appreciate the scenery at Craters of the Moon, but they did. We were perhaps helped out by the fact that there was a lot of boiling mud at the time we visited, but the kids also seemed impressed by the steam just rising out of the ground. After lunch, we let the kids enjoy the large central playground in Taupo, then we headed back to the hotel and Mr. Snarky took them down to jump on the trampoline by the office while I had a rest. That evening we went to the hot pools, which are thermally heated fresh water swimming pools. I was skeptical of the idea of going for a swim at night in the middle of winter, but I am glad I let Mr. Snarky win this argument. We had a great time, and it really was one of the highlights of the trip for all of us. It was the perfect way to wind up our visit to Taupo- the next morning we packed up the car again and headed on to Wellington. Our last stop in the Taupo area was to drive up to Chateau Tongariro on Mt. 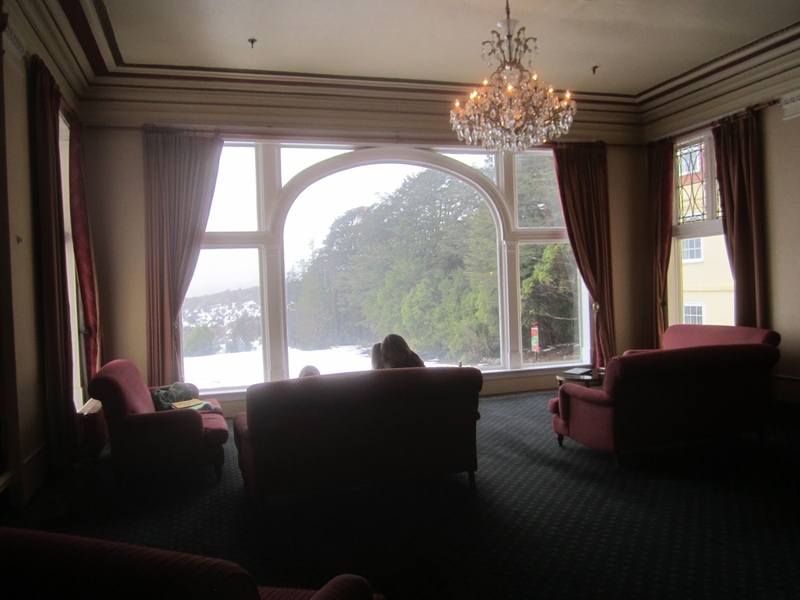 Ruapehu, a ski resort that dates from 1929. Mr. Snarky had never visited and insisted we detour to see it. The lounge was grand. I cannot report on the quality of the high tea, since we were too early to sample it. The highlight for the girls was undoubtedly the chance to build a small snowman and throw some snowballs. Our snowball throwing technique needs work. And on that note, I'll close this installment, and will pick up the rest of the drive to Wellington next time! Your first trip to New Zealand sounds a bit like mine! 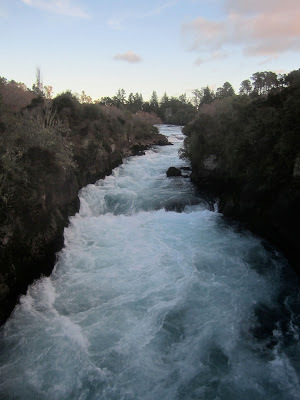 We although we drove through Hamilton, and stopped in Cambridge, but we stayed in Taupo, visited Huka Falls... I had the first taste of the ubiquity of my husband's family in NZ at Huka Falls. We were standing there looking at the falls when there was suddenly much shouting of his name and three of his cousins (who usually lived in Wellington) appeared. I think we might've been to the honey place too. I recall some really nice honey blended with peaches and spices. However, I couldn't take any back to Perth as honey is a prohibited import. Did you stop at the Sheep and the Dog in Tirau? That always entertained me when we went past, particularly at night when the lights in the eyes made them look a bit evil. I went skiing for the first time ever at Whakapapa. I have also had a hot chocolate at the Chateau and taken photos of my friends from Australia getting all excited about snow :-) I haven't stayed there though, it was a bit expensive on our student/graduate budgets!